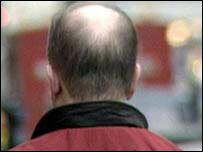 Goodbye Hair Loss, a cure for baldness? Hair loss in humans might not be irreversible, suggest scientists who have helped create new hair cells on the skin of mice. It was thought hair follicles, once damaged, could never be replaced. But a University of Pennsylvania, US, team, writing in the journal Nature, says hair growth can actually be encouraged using a single gene. A UK expert said the study could prove more important in aiding development of better wound-healing techniques. The researchers said that their findings “opened a window” for new treatments not only for baldness, but for other aspects of wound healing and regeneration. British expert Professor Des Tobin, from the University of Bradford, said: “This paper provides convincing evidence that the skin has remarkable powers of regeneration, not just repair as previously known. “It was long thought that hair follicle development, under physiological conditions, was limited to early developmental process in the embryo.